The pro‘s choice. Renowned sound engineers rely on ew 500 G4‘s flexibility, especially when handling multi channel settings on the world‘s music stages. Up to 88 MHz bandwidth, up to 32 channels. Ethernet connection for Wireless Systems Manager (WSM) control software included for advanced frequency coordination in multi-channel setups. 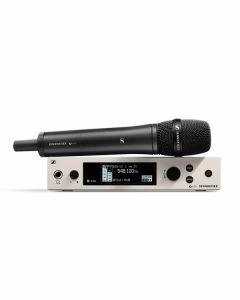 The pinnacle of the evolution series, powered by Sennheiser’s renowned e 900 capsules e 935, e 945, and e 965 on a lightweight black aluminum handheld transmitter, ready to take the world’s biggest live stages.